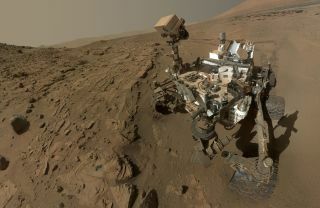 NASA's Mars rover Curiosity, seen here in a self portrait, has made major discoveries on the surface of the Red Planet. The Discovery Channel will chronicle the mission in Red Planet Rover, airing Dec. 18 at 10 pm ET/PT. NASA's Mars rover Curiosity has discovered organic molecules, the building blocks of life, on the surface of the Red Planet and the Discovery Channel will chronicle the amazing find in a special broadcast tonight (Dec. 18). The Discovery Channel documentary "Red Planet Rover" will chronicle Curiosity's mission to explore Gale Crater on Mars. This week, NASA announced that Curiosity has discovered organic molecules on Mars, as well as water locked inside Martian rocks and a strange methane spike in the planet's atmosphere. Tonight, Discovery Channel will cast a spotlight on the organic matter discovery. The Curiosity rover landed on Mars in 2012 and has found clear evidence that the planet was once a habitable place for life in the ancient past. The discovery of organic molecules and methane are further pieces of evidence as Curiosity continues its mission. "When we look at Mars, we have to wonder did life happen there as well? If so, what happened to it?" Gentry Lee, a veteran engineer with NASA's Jet Propulsion Laboratory overseeing Curiosity, said in a statement. "If life evolved first on Mars, what’s the possibility that life was knocked off of Mars and carried all the way to the planet Earth? Perhaps you and I and everything that’s living on the planet Earth are Martians!" "Red Planet Rover" will air on the Discovery Channel at 10 p.m. ET/PT. Check local listings.